Rapidly deploy and easily manage distributed networks. Today, many companies are adopting a remote work option for their workforces. This option is influenced by advances in technology, an increasing concern for the environment, higher transportation costs, real estate expense and the need for business continuity. Remote work is widely understood to provide companies with improved productivity and lower overhead costs for such items as real estate, utilities, and maintenance. It is vital for IT departments to be able to deploy and manage a teleworking solution that provides remote workers and branch offices with consistent, secure access to the company’s network. ManageExpress Virtual Office (MEVO) is an operations automation and management tool that allows you to set up and deliver the Cisco Virtual Office (CVO) solution. 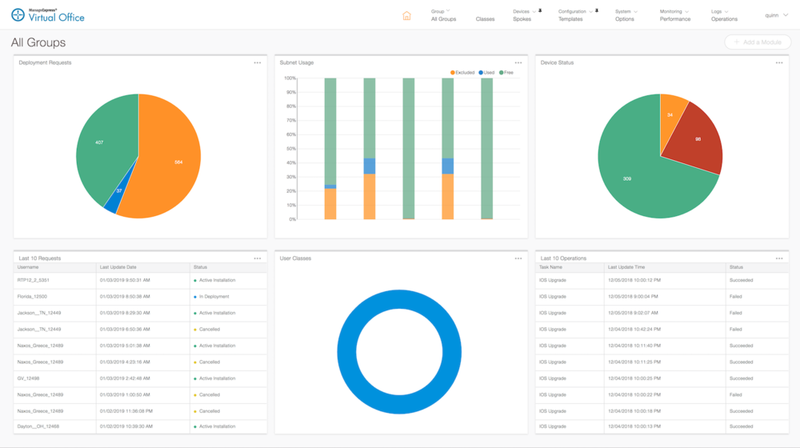 The MEVO tool enables seamless delivery of secure network services using Cisco virtual operations by managing spokes, headends, and infrastructure devices from a single user interface. MEVO provides multiple role-based user experiences. The Administrative Portal enables the management of all aspects of service delivery and the Employee Portal enables signup and basic self-management of requested services. Secure provisioning with a username and password. Open a web browser, authenticate, and choose your config. A certificate request is then pre-authorized and the configuration is pushed automatically. Day 2 configuration changes & image updates. Audit devices to find configuration issues. Software updates and configuration changes can be made on demand. Templatized configs with variables and operators. A series of templates are used at the time of provisioning to automatically build the preferred configuration based on class of device. Users can authenticate into the system using AD, one time accounts, local accounts, OTP or CAC/PIV. Built in subnet and device IP address management. Input an uber net, MEVO will allocate a super net which can be further sub-divided into subnets for a specific device. Add or release IP’s any time. Limit access based on the type of user and role. Different MEVO admin roles provide provisioning-only views, day 2 management, or read-only access.